I need me some comfort food. Really? After the over indulgence in the ultimate comfort food meal last week and the endless leftovers? And yes, I can do this in a health way: why cauliflower of course. Again I can hear you saying ‘what?’ How can this crunchy, slightly sulphurous, and bitter veg be considered a ‘comfort food’? Roasting baby. Suddenly, okay maybe more like in 25 minutes, cauliflower is transformed into sweet and nutty deliciousness. If you were not a fan of this member of the cabbage family before, you will be after a bite of it in it’s roasted state. Once you go roasted you might further branch out from the raw florets on a crudite platter to a velvety puree or mash, or a creamy soup. But back to that crudite platter for a moment. 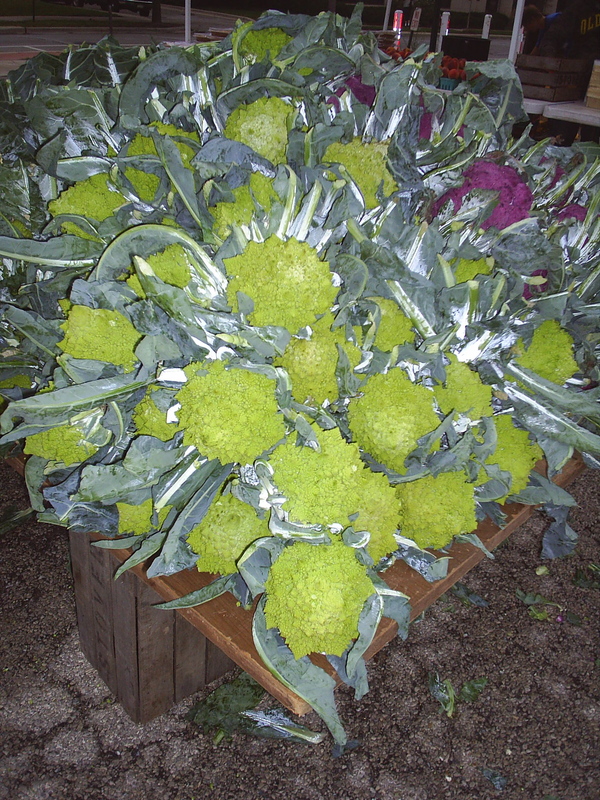 With such beautiful varieties like the vitamin A packed orange Cheddar, the purple varieties that are full of the antioxidant anthocyanin (see, red wine isn’t the only way to get this antioxidant), and then there is the gorgeous green Romanesco with it’s spiky curd (yeah, the ‘head’ is actually a collection of curds or underdeveloped flowers, go figure), not only will you be loading up on lots of healthy goodness (all are low-cal, high in fiber and high in vitamins C and K), but your platter will be knock out good looking. Get to the market and look for clean compact heads (oh, I mean curds), that are spot-free and have bright color. Those that are wrapped in lots of fresh green leaves are being kept nice and fresh (and keep those leaves and stem for stock or soups-hello turkey stock!). And size? Doesn’t matter, whatever suits your needs or likes. 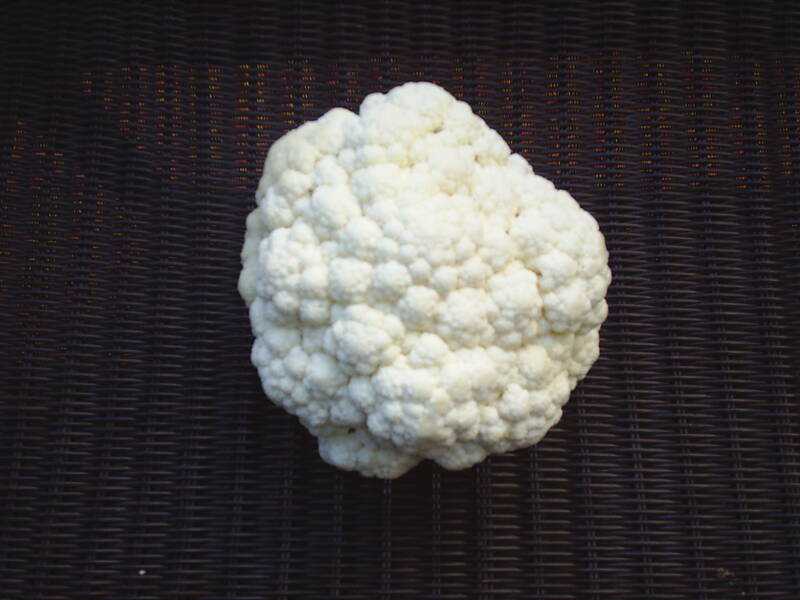 Store your cauliflower in a plastic or paper bag, stem side down, in the fridge, for up to a week. Typically I roast my cauliflower in just a bit of olive oil, garlic salt and pepper, but in the interest of keeping my husband healthy, I added some turmeric. Studies have shown that combining turmeric and cauliflower is a terrific way to preserve prostate health, not a lot of prostate cancer in India I am guessing. Preheat oven to 400 degrees. Core and cut cauliflower into 1 inch florets. 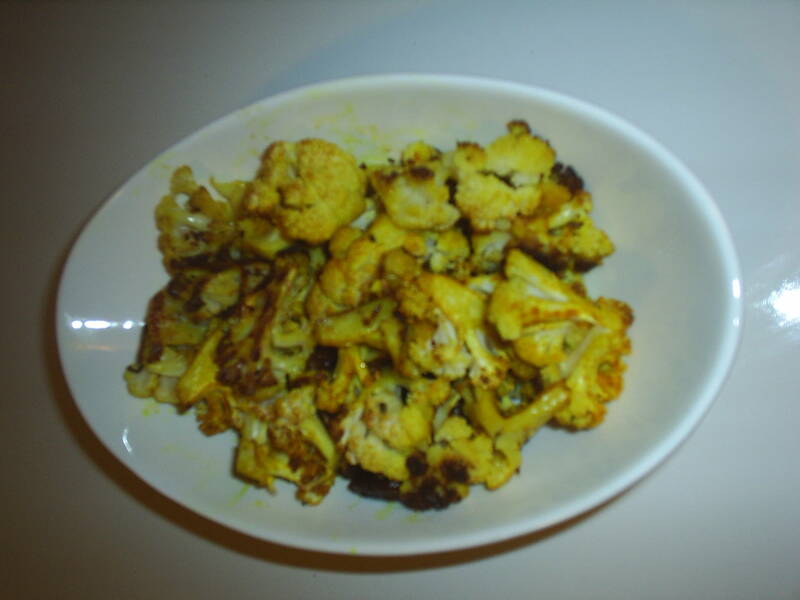 Toss the cauliflower with olive oil, turmeric, garlic, salt and pepper in a large bowl. Spread the cauliflower evenly, in a single layer, on a baking sheet with sides (jelly roll pan). Roast cauliflower until it is golden and tender, approximately 25 minutes. *’Plumped’ = raisins soaked in hot water for 10 minutes. This entry was posted in To Market with Mo and tagged cauliflower, Chicago Area farmers marekts, Chicago Farmer's Markets, comfort food, Evanston Farmer's Market, Farmers Markets, food artisans, fresh organic, fresh seasonal organic produce, Glenwood Sunday Market, Green City Market, moira's blog, raisins, roasted, sustainable, to market with mo. Bookmark the permalink. 2 Responses to A not so guilty pleasure? Moira; Cauliflower is my favorite vegetable. I love it almost burnt in a wok with olive oil and sea salt. I love roasting it and how it gets crispy. I love it steamed and mashed with sour cream and butter. (Paula Deen would love me.) You couldn’t write enough about this fabulous vege. I love it cold in a dip or salad. Raw or steamed, boiled – and fried…. in tempura…..Even the Melting Pot knows that! Cheese fondue is nothing without Cauliflower. And even my kids will eat it that way! I also love cauliflower. To avoid carbs I made Cauliflower mashed potatoes. It was good. Just steamed it and then put in a food processor with some mayo and salt and pepper. It was creamy and good.